If you haven’t hit your third year of vet school yet, you’ve heard about this week being incredibly stressful and tiring. For a lot of people, it is the first time they are doing a spay or neuter surgery on their own. Making sure to keep an animal alive and healthy, then continuing going to class and studying can add a lot of workload during that one week. However, because this experience can be extremely nerve-racking, it is all the more rewarding. When we started third year this fall, we began delving into all the information for junior surgery. We had lectures on what would happen so that we could be prepared. This year, they started giving us cadaver labs, which differs from previous years. Usually, you just watch videos and then go in and somehow perform a surgery (this is similar across the veterinary school curriculum). What the cadaver labs gave us was a chance to perform these surgeries without stress, to practice our technique, and to ask questions. This was a great opportunity and I think it took a little bit of the uncertainty away. A second new process that started with our class was that we would not have surgery during exam weeks. This was a major breakthrough as junior surgery takes a lot of time and energy, forcing school work to the back burner. We are incredibly grateful for Dr. Agapis, who runs junior surgery and made this happen to relieve some of our stress. Regardless of the preparation or what week you have surgery, there is just naturally anxiety. There is truly no way to relieve this fully as your group is responsible for a life during the week. Each group is assigned a patient for that week of surgery. The patient can be feline or canine, male or female, depending on the pets available from the shelter. Each person in the group has a specific role, which switches every surgery week. The roles include floater, anesthetist, surgeon, and assistant surgeon. The floater is available to aid in preparation for surgery, help the other roles when needed, and just be a supporter. The anesthetist is in charge of monitoring the patient to ensure an appropriate anesthetic plane throughout surgery. The surgeon and assistant both scrub into surgery, and the assistant is there to help in whatever way the surgeon needs. Everyone works together to maintain patient health and help things go smoothly. The week begins with the animals being dropped off Monday morning. During the lunchtime rush, we all go do a physical exam on our patients and run lab work to make sure they are healthy to undergo surgery. If there is an issue, we can perform extra diagnostics or set up a consult with one of the services in the hospital. Any animal that is not a good candidate for surgery is not eligible for the spay or neuter, and that group may be given another animal if one is available. After working up our patients, we put all of their information into our patient software, VetStar, and prepare for the next day’s surgery. Every day the group performs a physical exam to make sure their patient is doing well. Tuesday morning, surgery begins. Physical exam sheets need to be in by 7 a.m. to verify the patient is still doing well. Groups normally arrive at the school between 5:30 and 6 a.m. to allow enough time for a full physical exam and submitting paperwork. Each group is given their specific time to premedicate their patient and things start rolling from there. The patient is given an intramuscular injection to allow for sedation, shaved for surgery, and brought to the surgery room to be fully prepped. 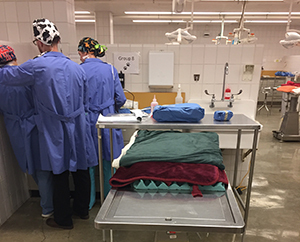 Even though students are responsible for our own patients, there are a lot of anesthetists and surgeons available to help us all during surgery. There are certain things we cannot do without a doctor, for patient safety reasons. An anesthetist helps each group’s anesthesia person place a catheter and place an endotracheal tube. Once this is done, the patient is flipped on their back to be scrubbed for sterility and then the surgeon and assistant begin to scrub in. Then the student in the group assigned to anesthesia monitors the patient until the end of surgery, and the surgeon performs the surgery. Every step of the way a doctor is available to help out or even scrub in, so you are never on your own. Is searching around the animal’s abdomen during a spay still incredibly stressful? Yes, it is, but whenever you are unsure about something or need help, there is a veterinarian available to you. This takes a lot of pressure off and makes junior surgery a lot better than we all had assumed it would be. Once the surgery is over, we wait as the patient wakes up and the patient’s temperature returns to 100 degrees, at which time the patient can be relocated to the wards. Later in the day we perform another physical and make sure our patient is doing well post-op. Each member of the group continues to work together to get paperwork submitted and observe that the animal is sound, while also giving them a lot of well-deserved attention. Once we start getting the hang of this process, each passing week of surgery goes more smoothly. As long as there are no complications and the patient is healthy enough, the shelter comes Thursday morning to take the animals back. Veterinary students and staff may adopt the junior surgery patients before the animals go back to the shelter leave. On the day the pets go back, we are relieved, knowing we’ve kept them healthy and alive. At the same time, it can be a little sad when they go because we get attached to these animals each week. At the end of it though, we have all gained that much more experience for the real world we will soon be in. We are also learning each week how to better work with our group and make sure everyone’s opinion on something is taken into consideration. This enhances our ability to communicate and see multiple points of view. This week can definitely be all we had heard it could be: stressful, exhausting, and in the beginning very confusing and overwhelming. However, nobody tells you how much you truly get out of this experience. We all learn how to work with people we may have never interacted with before, how to perform an actual surgery on our own or monitor the patient and calculate everything out, how to overcome stressful situations and do what is best for the patient. Without this experience, we could be going into a job one day without ever having done our own surgery, which is absolutely terrifying. This week definitely takes a lot out of you at times, but having your group as a support team and the hospital staff really pushes you to success. 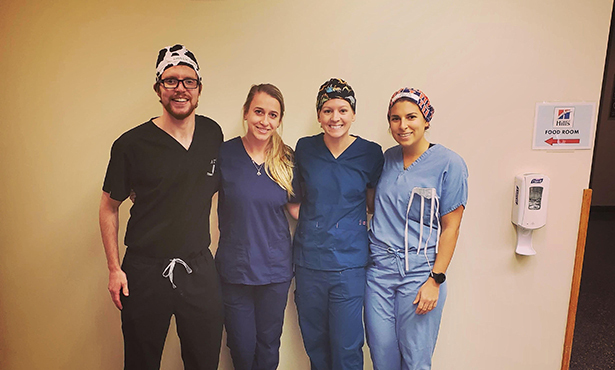 Surgery week enables you to prepare clinical skills you will forever need to have as a vet, to balance multiple things in life at once, and to work in an efficient way with others. So while surgery week can be taxing, it is all the more rewarding at the end of it. Without this whirlwind experience, none of us would be as prepared to take on the role of a veterinarian.